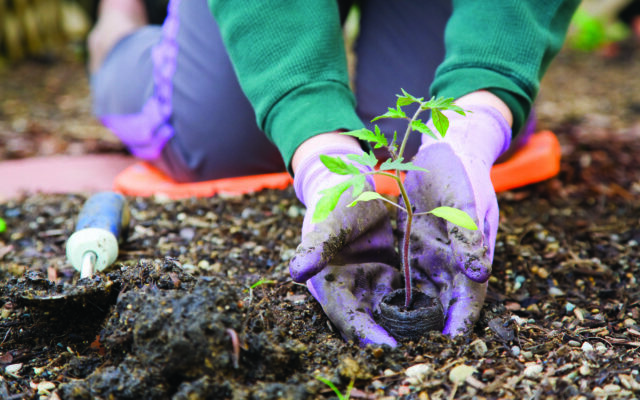 Sustainable gardening practices for the beginning gardener. There’s nothing more satisfying than a just-picked strawberry or ripe green beans fresh from the garden. There are also important added health benefits to growing your own food. A study published in the Journal of Science of Food and Agriculture conducted by researchers at the University of California, Davis found that the loss of nutrients in fresh produce during shipping and storage may be more substantial than previously thought. So eating food straight from your garden can mean more nutrients, as well as the added health benefits of the physical work of gardening. These are just some of the reasons backyard gardening has become such a significant trend across Maine. Mainers are turning their yards into gardens and getting closer to the food they eat. However, many hesitate about organic gardening because it can be expensive. Organic seeds, fertilizer and pest-control items can be costly. Thankfully, there’s a way to make organic gardening affordable as well. Sustainable gardening is the key. Sustainable gardening, in its most basic sense, is about growing your food in a way that doesn’t harm the Earth and, instead, enhances it. But there’s another added benefit to sustainable gardening — it can make your gardening much more cost efficient. By using what you already have and creating a little “circle of life” in your backyard, you can save money and eat well. It can feel a little overwhelming if you’re just getting started and want to learn some sustainable gardening practices. The key is to start small and slowly, adding a few strategies each year. It may take you several years to get to where you want to be, but starting small is still starting. And when it comes to saving the planet and your money, every little bit counts. Eric Sideman, Crop Specialist at MOFGA (Maine Organic Farmers and Gardeners Association), says gardening always starts with your soil. “No matter how small, the key to organic gardening is to pay attention to the soil. The basic approach is to build up reservoirs of natural sources of nutrients, and to maintain a healthy soil that supports the plants efforts to get those nutrients,” he says. He also recommends getting your soil tested at the University of Maine Soil Testing Lab before you begin. Thankfully, sustainable gardening practices provide some simple and affordable ways to start building your healthy soil. One easy way to build your soil without any extra cost is to compost your leaves or lawn clippings. There are many methods and strategies for composting, and you can choose a method that works best for your needs and lifestyle. Essentially, composting involves using leaves, yard and garden waste, and food waste from your home to build organic matter that’s good for your soil. During the fall, mulched leaves and grass clippings can be turned straight into your garden. But, during the summer, simply adding grass clippings to a compost bin or pile will help you build important nutrients to be added to your soil. Waste from the kitchen, such as food scraps, egg shells, and even a few coffee grounds, can be used in composting, and it’s a great way to reduce waste from your home and yard and make good use of it. Compositing helps build your soil, which helps you grow more fruits and vegetables in your garden. If you don’t have chickens and are looking to live a more sustainable life, chickens are a farm animal to consider. They’re easy to care for, and hens can be kept in backyard coops, even within city limits in some cities across Maine. Just be sure to check your local ordinances. Many Mainers already keep at least a few backyard chickens for eggs, but some are missing important opportunities to add chickens to their gardening practices. Lisa Steele is a fifth-generation chicken keeper here in Maine and author of the book Gardening with Chickens. She explains that chickens can be an easy and important part of sustainable gardening. While chicken manure by itself will burn your plants, add chicken manure to your compost can help make a perfect fertilizer for your garden. Steele recommends straw, leaves, and in some cases, even pine needles in your coop. In the winter, using the deep litter method where you add layers of straw in your coop and turn over the mixture every day helps the chicken manure break down, creating a mixture that can be ready to go for your garden in the spring. “It [chicken manure] really needs a couple of months to be ready for your garden, so use common sense,” Steele says. But using waste from your chickens that are already providing you with food and pest control is a perfect way to build a sustainable cycle of life for your garden practices. Chickens can also help prepare your soil and rid your garden of unwanted grubs both before you plant in the spring and after you harvest your fruits and vegetables in the fall. While chickens are the easiest farm animal to care for and an efficient way to add to your sustainable gardening process, don’t think you need a large flock to make a difference. “You can start really small, with just two or three chickens. You don’t need a large flock to make a difference,” says Steele. JJ Starwalker, vice president of the Penobscot County chapter of MOFGA, says watering efficiently is another important part of sustainable gardening. Watering the roots of your plants will save your water and your money. Starwalker uses soaker hoses (porous hoses that seep water slowly) for seeds and waters close the ground all year round. “I don’t need to water the air or the space between rows,” she says. While seed saving may sound intimidating, basic seed saving of some larger seeds is easy and will save you money each year. When just getting started, think about your growing projects from elementary school. Dry beans, peas, and green beans are all easy to save and plant the following year. When you harvest, just leave some green beans, dry beans, or peas on the plants. Let the pods start to yellow; pick them; shell them; and store them in a cool, dry place for next year. Other plants, such as carrots and tomatoes, are a little trickier when it comes to seed saving, but saving the big, simple seeds is a great place for beginners to start and can make vegetable gardening more affordable and fun. The University of Maine Cooperative Extension offers detailed support for seed saving in Maine.